Blood pressure definition regards blood pressure as the pressure exerted on the artery tube while blood flows through the arteries. Ideal blood pressure for an adult man or woman is 120/80mmHg and can raise up to 140/90mmHg before raising alarm. However a reading of 140/90mmHg warrants introduction of lifestyle modifications such as a hypertension diet as well as other foods that lower blood pressure in order to keep the blood pressure from raising any further. Blood pressure measurements are read in millimeters of mercury (mmHg) and is an interpretation of Blood pressure numbers presented as systolic and diastolic blood pressure values. The systolic number is bigger and on top e.g 120mmHg and the diastolic number is smaller and at the bottom i.e 120/80mmHg. This is how to read blood pressure numbers. A meaningful and complete blood pressure reading has these two numbers one on top of the other. The systolic blood pressure number on top is bigger because it is recorded during heartbeats when blood pressure is highest. The diastolic number is smaller because it is recorded in-between heartbeats when the heart is briefly at rest. In other words the pressure measured when the heart contracts and sends blood out of the heart is systolic (highest) blood pressure. The pressure measured when the heart dilates with blood flowing back into the heart is called diastolic (lowest) blood pressure. As spoken values, blood pressure numbers are read out as 120 over 80 millimeters of mercury i.e 120/80mmHg. It is important to know how to read blood pressure chart in the context of each issuing hypertension institution. Blood pressure charts are issued as part of hypertension guidelines by leading hypertension specialist institutions such as the WHO, BHS, EHS and the AHA. They are important in high blood pressure treatment including hypertension medications prescriptions. Due to the fact that the blood pressure charts are issued by different institutions, it leaves room for variances even though normally slightly in the categorization of corresponding high blood pressure stages. The chart above indicates that optimal blood pressure is blood pressure numbers less than 120mmHg of systolic reading and less than 80mmHg of diastolic reading. 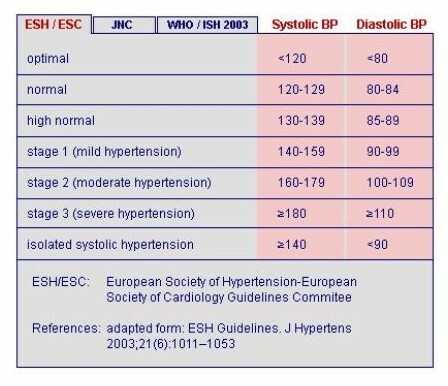 In the chart above Stage 2 hypertension which is known as mild hypertension ranges between 140-159mmHg of systolic reading and 90-99mmHg of diastolic blood pressure reading. It must be noted that using the chart will require that you have your blood pressure reading at hand for the chart to help you understand your readings. In other words the chart is only a function of the known readings. 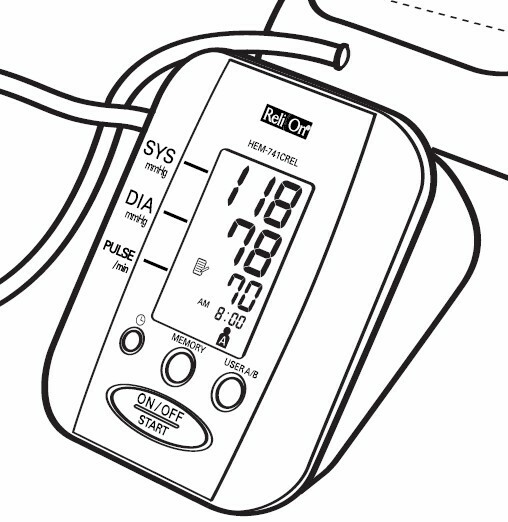 As shown above a digital blood pressure monitor gives two key numbers which are the systolic reading - bigger number on top - and the diastolic reading which is the smaller number below the systolic reading display. Some monitors will show an additional number which represents the pulse reading measured in pulse per minutes. This simplified means the number of times your heart beats per minute. The pulse rate function is particularly important and worth checking for in any new home blood pressure investment as it is used to interpret the status of your heart health. Pulse reading can detect irregular heartbeat which is associated with cardiovascular problems. In reading blood pressure information on your monitor, always start with the systolic reading followed by the diastolic reading. In the picture above we can read the home digital blood pressure monitor blood pressure measurements as 118/78mmHg. This is how to read a blood pressure monitor's displayed readings.